● The Main Menu is located at the top. All available actions and options are available from this menu. ● The Toolbar contains graphical icons that allow quick access to frequently used actions in the menu. More information available in the Toolbar section. ● The Station Tree lists all the components (items) that are present in the station. These items can be robots, tools, objects, targets or specific settings for manufacturing or calibration purposes. The tree allows understanding and modifying the dependency that exists in the real environment. For example, a target can be attached to a specific reference frame, this reference frame can be attached to the robot base frame, robot tools are usually attached to the robot, etc. ● The Status Bar is located at the bottom and may display useful tips for certain operations. Tip: Selecting (or double clicking) an item in the 3D view will have the same effect as selecting (or double clicking) in the item in the Station Tree and vice-versa. Double clicking an item (in the tree or the 3D view) will display a new window with the item’s properties. For example, double clicking a robot will display the Robot Panel. These windows can be closed by selecting the cross at the top right of the sub window. As an exception, double clicking a target will move the robot to that target. If a target is just selected once (instead of double clicked) the robot will simulate a linear or a joint movement from its current position to that target. Set Default Settings to revert to the default size. Double click a robot in the item tree (or in the 3D view) to open the robot panel. 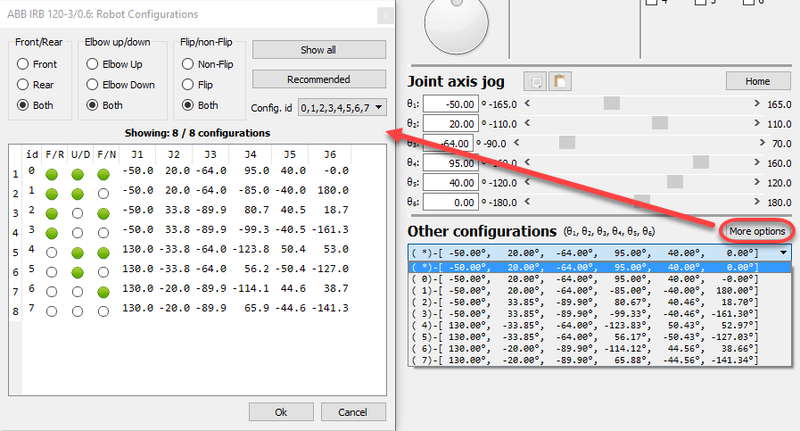 It is possible to jog the robot axes from the Joint axis jog section and enter specific joint axis values in the text boxes. These values and the robot position matches with the robot controller values. Double click the joint limits to modify the robot axis limits. By default, RoboDK uses the hardware limits from the robot manufacturer’s specifications. Some applications may require more constrained axis limits (software limits). The joint values can be copied or pasted as a list of values, using the corresponding buttons in that section. ● The Tool Frame (TF) with respect to the Robot Flange (FF) defines where the selected Tool Frame is located with respect to the Robot Flange. The Robot Flange is always the same, however, the Tool Frame changes depending on the tool that is mounted on the robot. This relationship is also known as UTOOL, ToolData or just Tool in most robot controllers. The Robot Tool is also known as the TCP (Tool Center Point). The Selected Tool becomes the “Active” tool. 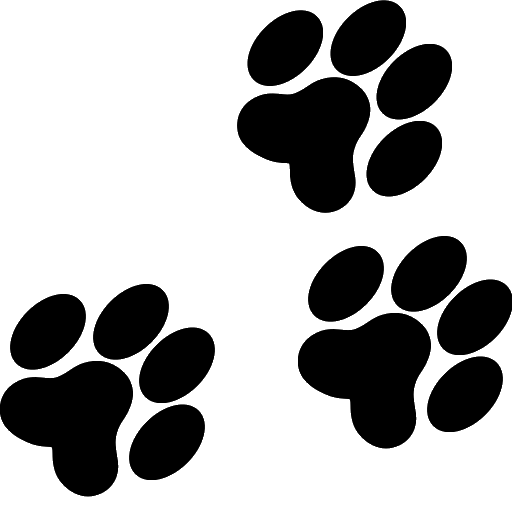 The active tool is used when creating new targets and programs. 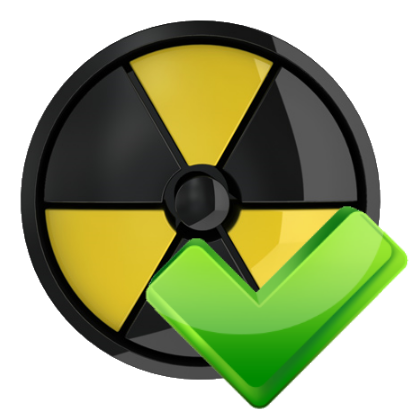 The selected tool displays a green mark in its icon: . Note: Modifying the Tool Frame in the robot panel will modify the position of the selected/active tool. This has the same effect as modifiying the tool from the Robot Tool settings. ● The Reference Frame (RF) with respect to the Robot Base (BF) defines where the Reference frame is located with respect to Robot Base Frame. The Robot Base Frame never moves, however, different Reference Frames can be used to position any objects with respect to the same Robot Base Frame. This relationship is also known as UFRAME, WorkObject MFRAME or Reference in most robot controllers. The selected reference frame in the robot panel becomes the “Active” reference frame. The active reference frame is used as a reference for new targets and robot programs. The selected reference frame displays a green mark in its icon: . Note: Modifying the Reference Frame in the robot panel will modify the position of the selected/active Reference Frame. This has the same effect as modifiying the Reference Frame from the Reference Frame settings. Teach Target), together with the robot axes. The target is also attached to the Active reference frame. Tip: Using the mouse wheel on top of each colored case with the coordinates will update the value and move the robot. A list of possible configurations is available in the Other configurations section. The robot configuration defines a specific state of the robot without crossing any singularities. Changing the configuration requires crossing a singularity. More information available in the Robot Configurations section. Finally, the Parameters button at the top right allows making some kinematic adjustments, selecting the preferred post processor or extract accurate parameters after a robot calibration project. Modifying these values should only be required in specific circumstances. Double click a Robot Tool to see more details about that tool and modify the position of the Tool Frame (also known as Tool Center Point, or TCP) with respect to the robot flange. Note: The TCP pose can also be modified from the Robot Panel. Selecting More options… allows applying a scale factor to the geometry of the tool or move the geometry with respect to the robot flange. Altering these values has no impact on robot programs. The geometry is used for display purposes and collision checking. (keeping the TCP intact). Tip: It is possible to provide the position of the TCP with respect to another TCP by selecting that reference TCP instead of the robot flange. For example, a cutter tool can be defined at a specific distance along the Z axis with respect to another TCP that represents the spindle. This example provides more details. Double click a Reference Frame to see more details about that reference frame and modify its position with respect to the robot base frame or any other reference frame available in the station. By default, the coordinates displayed (pose) are relative to the parent of the reference frame (in this example, the robot Base Frame). Note: The Reference Frame can also be modified from the Robot Panel. Multiple reference frames can be related to each other to build the dependency that exists in a real application. For example, a table can have a specific position with respect to the robot. Then, two or more objects in the table can have a specific position with respect to the table reference. Moving the table reference will not alter the relationship between the objects and the table but will alter the relationship of all the objects with respect to the robot. The following image shows such an example. Tip: It is recommended to move objects using reference frames. In this case, it is easier to move them in the station and use the same reference frame as a reference for the robot targets. Teach Target (Ctrl+T) to create a new target. This will record the current position of the robot using the active reference frame and the active tool frame . The target will be added to the active reference frame. ● Right click a target, then select More Options… (F3) to see the recorded pose and joint values. Creating a new target records the TCP with respect to the reference frame in the Cartesian space as well as the current robot axes. 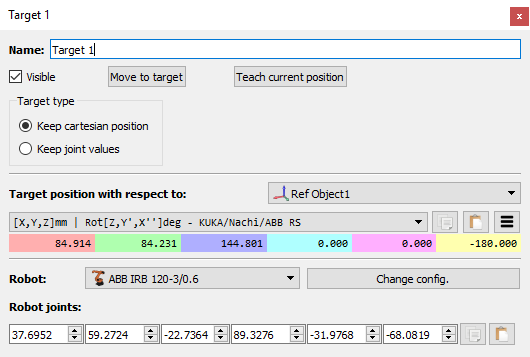 By default, RoboDK creates targets as Cartesian targets (Keep cartesian position ). In this case, if the reference frame is moved, the robot will try to reach the position of the target with respect to that reference frame. On the other hand, it is possible to specify the target in the joint space (Keep joint values ). In this case, the target is an absolute robot position and it will not be altered if reference frames are moved. It is common practice to use joint targets to reach a first approach position close to the working area, then, Cartesian targets ensure that the toolpath is not altered if the reference frame or the tool frames are modified. Tip: Selecting Move to target will have the same effect as selecting that target in the tree or the 3D view. It is possible to see other configurations to reach the same pose with the robot. More information in the next section. One robot configuration defines a specific state of the robot. Changing the configuration requires crossing a singularity. Robot controllers can’t cross a singularity when a linear movement is being made (a joint movement would be required for that). In other words, to accomplish a linear movement between two targets the robot configuration must be the same for the complete movement, including the first and last points. Right click a robot and select Change configuration to open the robot configurations window. It is also possible to open this window by selecting More options in the robot panel. 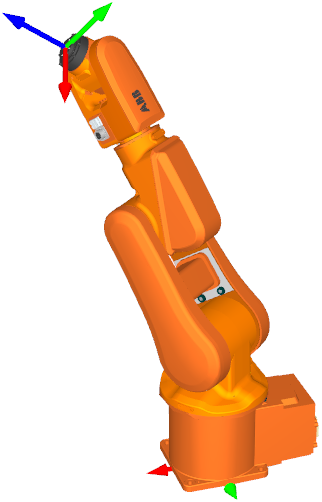 For a standard 6-axis robot there are typically 8 different configurations for any position of the robot if we assume each robot axis can move one full turn. In practice, joint limits can be more or less constrained depending on the robot. Therefore, it may be possible to have from 1 to more than 100 different robot configurations for a specific location depending on the robot. 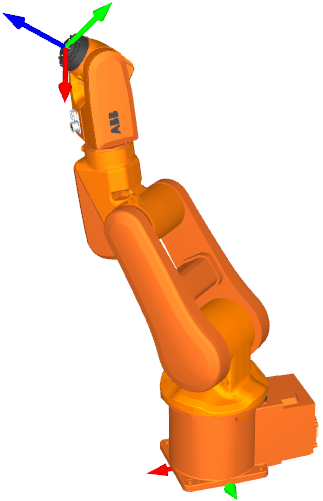 One robot configuration defines a specific way (assembly mode) of reaching a position with the robot. 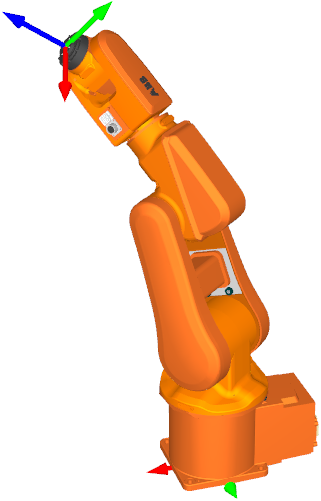 For example, the robot can have the elbow up or the elbow down (Up vs. Down, or U/D), at the same time it can be facing the target or the base can rotate 180 degrees to reach the target backwards (Front vs. Rear, or F/R). Finally, joint 5 can flip by switching the sign at the same time axis 4 and axis 6 compensate for that move (Flip vs. Non-Flip, or F/N). In total, this provides the 2*2*2=8 configurations. Objects can be imported from generic file formats such as STL, STEP or IGES format. Double click an object in the tree or the 3D view to open the settings window. It is possible to set or view the position with respect to any reference frame. However, objects are usually set up on reference frames and it is recommended to move the reference frame if an object needs to be moved. Objects can also be grabbed by robot tools after a certain simulation event occurs. The More options… menu allows changing the object color, applying a scale factor or moving the geometry with respect to its own reference frame. Tip: It is possible to merge multiple objects in one by selecting two or more objects (holding Ctrl key), then, right click and select Merge. 1. 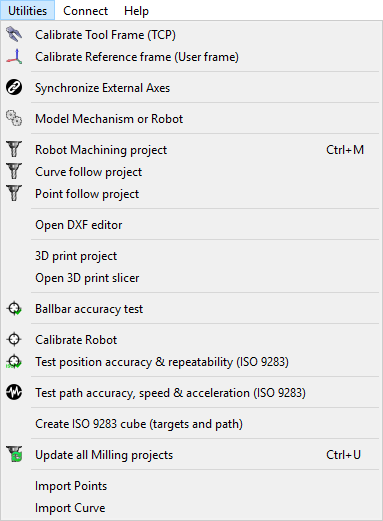 File menu: Allows importing new files (3D geometry, robots, tools, toolpaths, …) and opening or saving RoboDK projects (RDK file extension). 2. Edit menu: Allows to cut/copy/paste an item or a group of items and do undo/redo actions. 3. Program menu: Allows creating or modifying robot programs and other related options for Offline Programming (OLP). 4. View menu: Provides useful actions to navigate in 3D and set up specific views. 5. 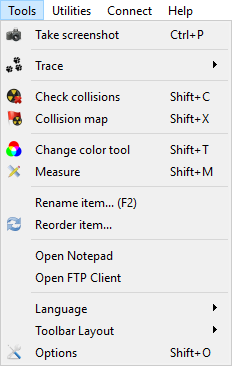 Tools menu: Provides general tools such as checking for collisions, measuring points, or opening the main options. 6. Utilities menu: Allows performing specific operations such as using robots for manufacturing operations, calibrating a TCP or a reference frame, using robots as a 3D printer or as a 5-axis CNC, calibrate a robot... These operations might require a specific license option. 7. 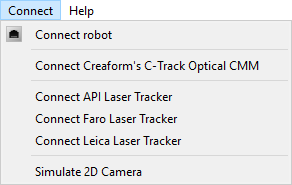 Connect menu: Allows connecting to a robot, a measurement system or simulate cameras. 8. Help menu: Allows opening the online documentation (F1), check for updates or set up a license. 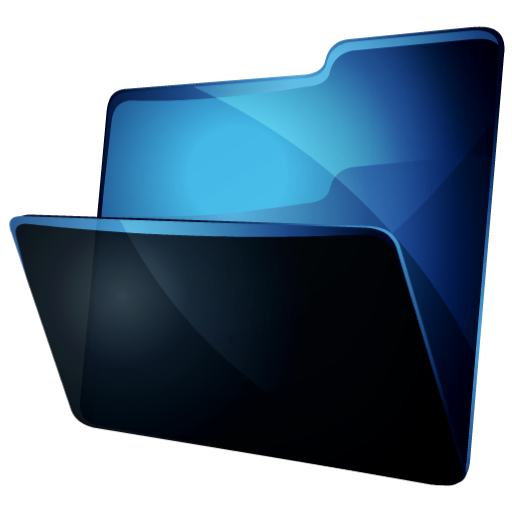 It is possible to Open, Save or export documents from the File menu. New Station will add a new station in the tree. One station can be loaded or saved as one RDK file. The RDK file (RDK extension) holds all the information about the robots and objects so it is not required to keep a separate copy of the imported items. Tip: It is possible to have more than one Station open at the same time. 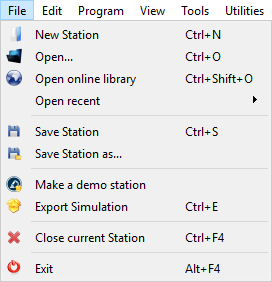 Double clicking the station icon in the tree will display that station. Open will load a new RoboDK file (RDK Station) or import any other recognized file formats, such as .robot for robot files, STEP/IGES/STL for objects, .tool for tool files, etc. Open online library will show a new window with the library available online. Save Station will save the RDK file. Select Save Station as… to provide the file location. Make a demo station will export the station as an EXE file with a simplified version of RoboDK. Export Simulation will export a specific program or simulation as a 3D PDF or 3D HTML file. Example. 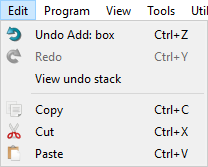 Undo (Ctrl+Z) and Redo (Ctrl+Y) actions are accessible from the Edit menu. The undo stack is also available and allows reverting changes, backwards or forward, to a specific state by selecting the action. It is also possible to cut (Ctrl+X), copy (Ctrl+C) or paste (Ctrl+V) one item or a group of items from the station tree. If an item is copied, all the items attached to it are also copied. check Bundle similar actions together. The program menu contains all the components related to Offline Programming (OLP) and program generation. It is possible to add new programs, reference frames, targets or tools to robots. These Offline Programming components (reference frames, tools, targets, etc.) appear on all programs generated offline. Add Reference Frame will add a new reference frame attached to the station root or attached to another reference frame if that reference frame was selected. Add empty tool will add a new TCP to a robot. No geometry is required to add a new tool. Multiple Tools allow referencing different parts of the same geometry linked to one tool. Teach Target (Ctrl+T) will add a new target to the Active reference frame for the Active robot tool. 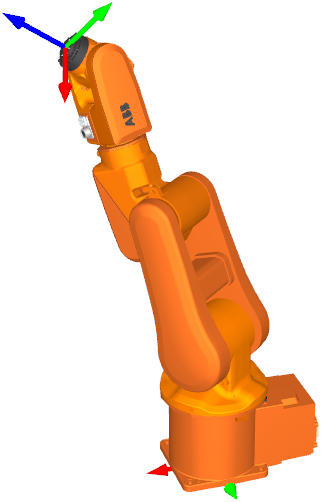 The active reference frame and active tool can be selected in the robot panel. It is also possible to right click a reference frame or a tool to make them active. Teach Targets on Surface (Ctrl+Shift+T) will allow the user to select points of an object to easily create targets. An example is available in this section. Add Program will add a new program that can be created using the RoboDK Graphical User Interface (GUI). No programming experience is required to create or modify this type of robot program. The robot program can be simulated and generated for a specific robot, automatically and easily. The Program Instructions section of the Offline Programming document provides more information about available program instructions through the GUI. Add Python Program option will include a sample Python program/macro/script/module in the station that links to the RoboDK API. A Python program using the RoboDK API allows creating robot programs from generic programming code (Python). It is possible to deploy these programs for any specific robot controller. It is also possible to simulate specific tasks to extend the GUI programs. These tasks can be robot subprograms for offline programming, online programming or simply simulate specific events such as making objects appear automatically at random spots for a pick and place simulations. A Python program is like a text file embedded in the station and contains Python code to automate specific tasks in RoboDK. The RoboDK API is deployed using Python by default but other programming languages can be used to interface with RoboDK. Note: The difference between a normal program (using Add Program) generated using the Graphical User Interface (GUI) and a Python program (using Add Python Program) is that the first does not require programming experience. On the other hand, a Python macro using the RoboDK API allows extending the limits of a program generated using the graphical user interface. Finally, it is possible to Add or Edit Post Processors. Post Processors define the way programs are generated for a specific robot controller, allowing to accommodate vendor-specific syntax. Post Processors are final component of the offline Programming Process. Most options required to navigate in 3D are available from the View menu. It is possible to Rotate, Pan and Zoom from this menu (as well as by right clicking the 3D view). This is useful for navigating in 3D using a laptop touchpad (instead of a mouse). Align rotation. Otherwise, RoboDK locks the station reference to keep the XY plane horizontal by default. It is possible to show or hide the robot workspace by selecting the asterisk key (*). It is also possible to switch between visible and invisible items by selecting the F7 key. Tip: It is possible to make the reference frames bigger or smaller by pressing the + or – key multiple times. If a lot of items are visible this is useful to adjust the size of the reference frames and properly grab them if they need to be moved from the 3D view (by holding the ALT key for example). 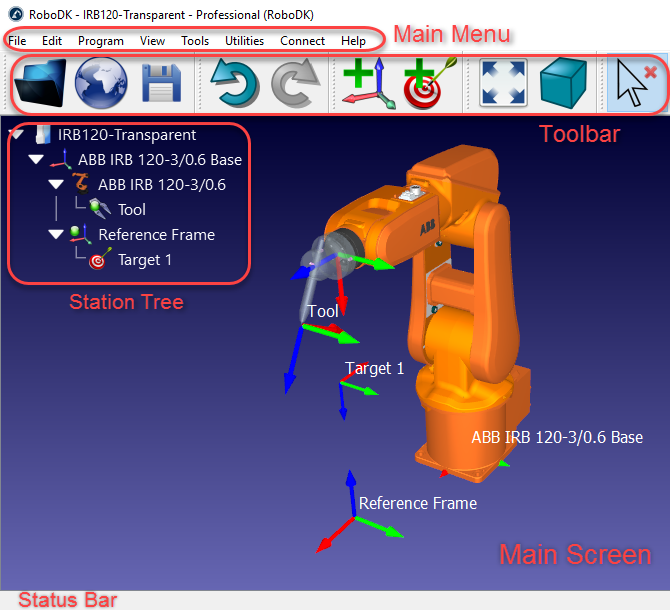 Generic tools are available in the Tools menu, such as taking snapshots of the 3D view, activating the robot trace, activate collision checking or measuring point coordinates. Activating the Trace will show the trace of all robots as they move. Check collisions will activate or deactivate collision checking. When collision checking is activated, objects that are in a collision state will be displayed in red. The Collision map allows specifying what object interactions are being checked. Note: More information available regarding collision detection in the Collisions section. Change color tool will display a small window that allows changing the color of robots and objects. It is also possible to flip the normal vectors of surfaces. Measure will display a window that allows measuring points in 3D with respect to a local reference frame or the station reference frame (absolute measurements). Language and select the preferred language. RoboDK will be displayed in the selected language immediately. Toolbar Layout allows setting up the default toolbar. Alternatively, it is possible to specify a toolbar for a more basic or more advanced usage. Select Options to open the main options menu. More information available in the Options Menu section. 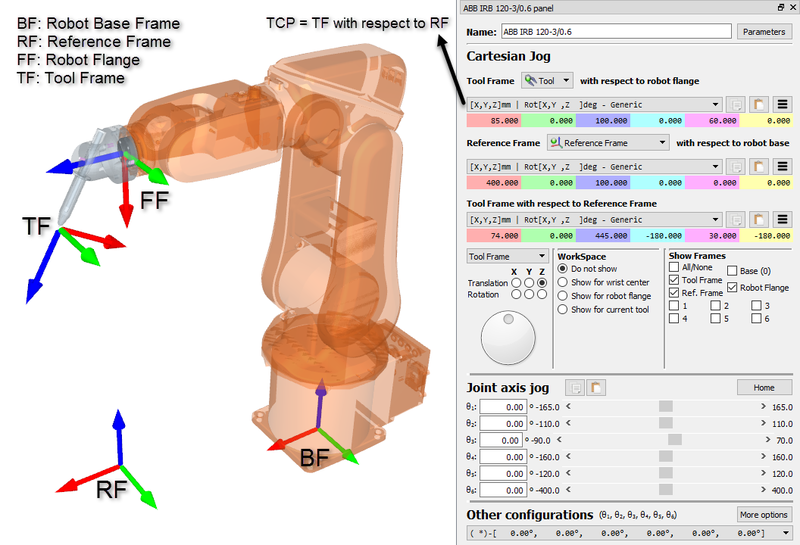 Calibrate Tool frame (TCP) allows calibrating a robot TCP by providing data from the real setup, such as the joint configurations to reach a point using different orientations. This procedure is usually available from most robot teach pendants. RoboDK allows calibrating a TCP with as many configurations as desired. Using more configurations allows obtaining a more accurate TCP value. Read more about TCP calibration. Calibrate Reference Frame allows identifying a reference frame with respect to a robot base frame. This allows accurately matching the part from the real setup to the virtual environment. Read more about Reference Frame calibration. Synchronize External Axes allows setting up one or more external axes and a robot as one robot mechanism. More information available in the External Axes section. Robot Milling project can easily convert machine toolpaths to robot programs. RoboDK can import programs made for 5-axis CNC using CAM software, such as generic G-code or APT files. 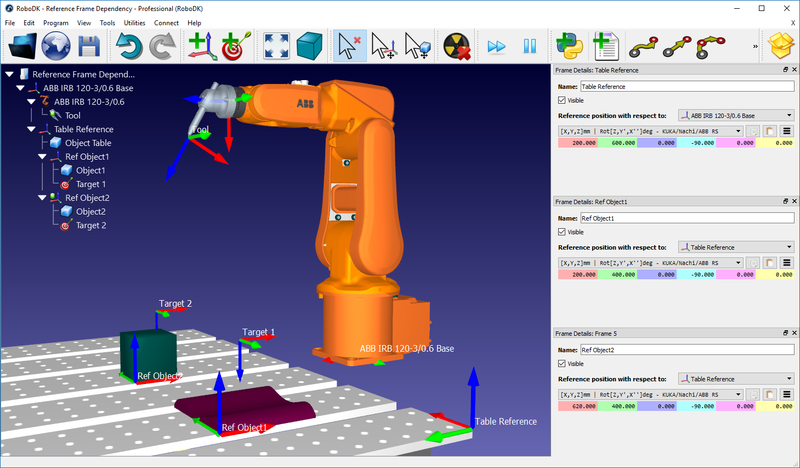 These programs/toolpaths can be easily simulated and converted to robot programs with RoboDK. More information available in this section. The Curve follow project is like a Robot Milling project but it allows selecting curves extracted from 3D geometry as toolpaths. It is also possible to select Import Curve to import 3D curves from CSV or TXT files. These curves must be provided as a list of XYZ points and, optionally, IJK vector. More information available in the curve follow project section. The Point follow project is like a Robot Milling project but it allows selecting points extracted from 3D geometry and easily create a robot toolpath. It is also possible to select Import Points to import 3D points from CSV or TXT files. These points must be provided as a list of XYZ points and, optionally, IJK vector. More information available in the point follow project section. Select 3D print project to generate a robot 3D printing program for a specific object. The object must be available in the RoboDK station. The 3D printing toolpath is converted to G-code behind the scenes using a Slicer and then treated like a 3-axis machining toolpath. More information available in the robot 3D printing section. The Ballbar Accuracy test allows checking the robot performance using a Telescoping Double Ballbar device. More information about robot ballbar testing available here: https://robodk.com/ballbar-test. Calibrate Robot allows setting up a robot calibration project to improve robot accuracy and find robot error parameters. A calibrated robot can be used in any RoboDK Offline Programming project. Robot calibration usually improves robot accuracy by a factor of 5 or better, depending on the robot model. Robot calibration requires using measurement systems to take robot measurements. Robot accuracy and repeatability can be tested with ISO9283 before and/or after calibration. More information about robot calibration and performance testing here: https://robodk.com/robot-calibration. Note: Some of these tools might require a specific license that extends the default offline programming license. It is possible to connect to a robot and enter the connections parameters, such as the robot IP, FTP username and FTP password. Setting up a robot connection allows transferring programs through FTP or running programs directly from the PC for certain robots through supported robot drivers in RoboDK. New robot drivers can be developed by end users, more information available in the robot drivers section. It is also possible to connect to supported measurement systems such as laser trackers or the Creaform Optical CMM. This allows to fully automate robot calibration and performance testing. Help (F1) opens this documentation online. A PDF version of the documentation is available for download at the top of each section. When you press F1, RoboDK displays the Help topic related to the item currently selected. Select Check for updates… to check if an update is available. A message will pop up with a recommended update or just notifying that the current version is already up to date. If no message pops up it means that a firewall is blocking communication between RoboDK and internet.